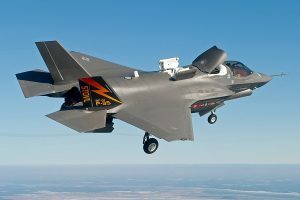 Photo: The F-35A prototype, AA-1, above the desert during a test flight. This aircraft was retired in December 2009 after 91 sorties and was used as a live weapons target. All images Lockheed Martin unless credited otherwise. AA-1 first flew on December 15, 2006 in the hands of Chief Test Pilot John Beesley and was retired almost exactly three years later. 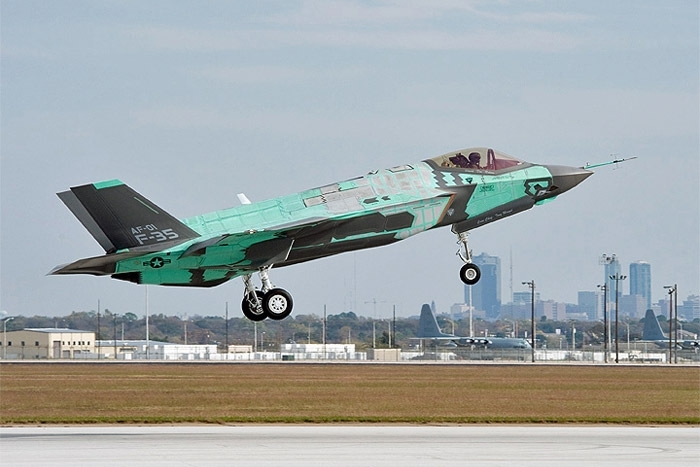 The first definitive F-35A, AF-01, first flew on November 13, 2009 enabling the original prototype AA-1 to be retired. The first flight of AF-01 is positive news for Lockheed Martin and its flight test team, but the aircraft should have taken to the air five months earlier. According to Lockheed Martin’s revised schedule of May 2008, 13 aircraft were to have flown by October 2009. In reality AF-01 is only the fourth F-35 aircraft to fly since the contract was awarded in late 2001. AF-01 has joined AA-01 (now grounded and undergoing destructive tests at Naval Air Weapons Station China Lake, California) and three F-35Bs, BF-01, BF-02 and BF-03 short take-off and vertical landing (STOVL) variants currently in flight test. The first F-35B STOVL aircraft, BF-01, was the second aircraft to fly, becoming airborne on June 11, 2008. 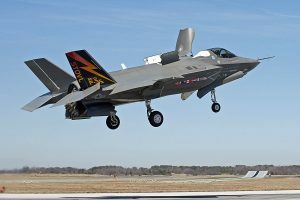 F-35B BF-01 made the first controlled vertical landing at Naval Air Station in Patuxent River, Maryland, USA on March 18, 2010. 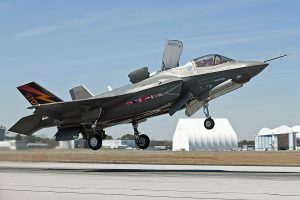 “Today’s vertical landing onto a 95ft square pad showed that we have the thrust and the control to manoeuvre accurately both in free air and in the descent through ground effect,” said F-35 Lead Short Take-off and Vertical Landing pilot, Graham Tomlinson, a retired Royal Air Force fighter pilot and a BAE Systems employee since 1986. 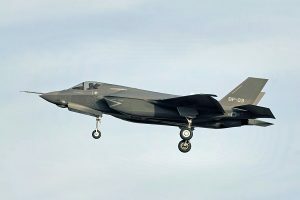 Tomlinson positioned the aircraft 150ft above the airfield, where the F-35 remained in the hover for approximately one minute before descending to the pad. “The low workload in the cockpit contrasted sharply with legacy STOVL platforms,” he added, presumably referring to the Harrier and AV-8B. During the hover pit trials, BF-01 was anchored on top of a metal grid about 15ft (4.57m) off the floor of the pit, to enable the aircraft to simulate free-air flight and to measure the output of the propulsion system comprising the engine, variable nozzle, lift fan and vanes. 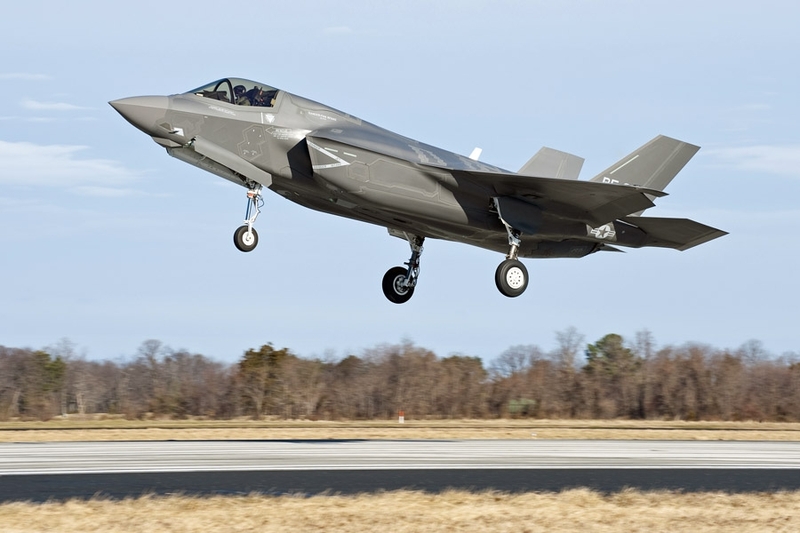 BF-01 is now assigned to the F-35 division of Air Test and Evaluation Squadron 23 (VX-23) ‘Salty Dogs’, one of NAVAIR’s resident units at Pax River and part of the F-35 Integrated Test Team. The vertical landing flaps and doors of the STOVL F-35B are clearly illustrated in this image of BF-01 during flight testing. 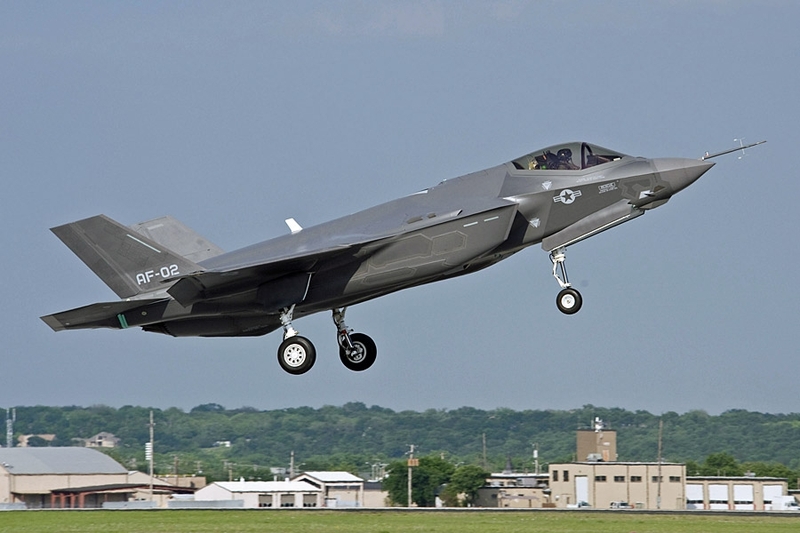 BF-02, the second F-35B, flew in February 2009 and was the first to be piloted by a pilot from the Royal Air Force. 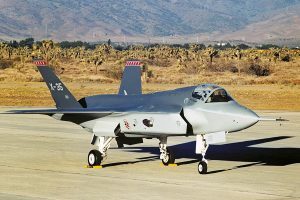 Two follow-on aircraft, BF-02 and BF-03, were delivered in January and February respectively, with the first mission systems-equipped F-35B, BF-04, arriving in April. 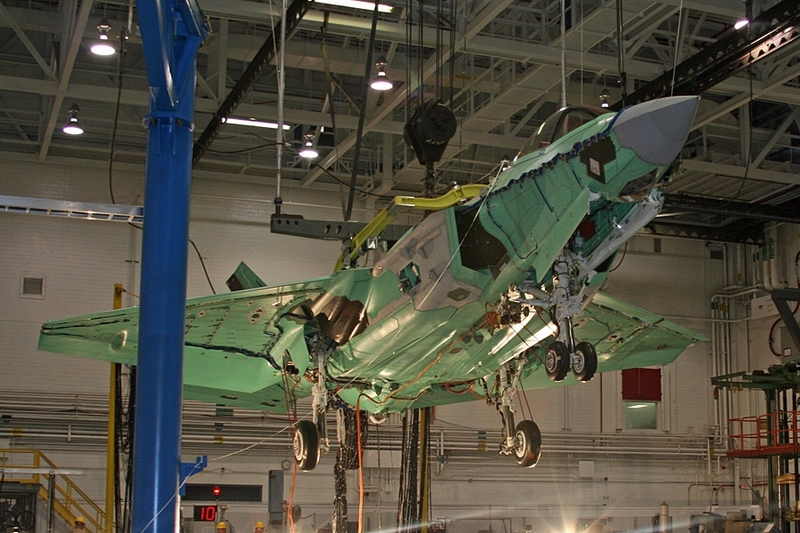 BF-03 is being used to evaluate vehicle systems and expand the aircraft’s aerodynamic and structural-loads envelope as well as weapons testing, while BF-04 is equipped with an avionics suite more representative of the final production version, incorporating the Northrop Grumman AN/APG-81 Active Electronically Scanned Array (AESA) radar; the Lockheed Martin Electro-Optical Targeting System (EOTS); the Northrop Grumman Electro-Optical Distributed Aperture System (EO-DAS); a BAE Systems Electronic Warfare (EW) system; a VSI Helmet Mounted Display System (HMDS); the Northrop Grumman Integrated Communication, Navigation & Identification (ICNI) friend-or-foe identification; the Lockheed Martin Integrated Core Processor (ICP) with Block 0.5 functionality; a Honeywell Inertial Navigation System and Raytheon Global Positioning System. 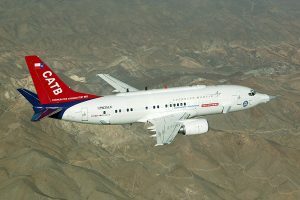 The new avionics package has already undergone more than 100,000 hours of laboratory testing and flight testing in the Cooperative Avionics Test Bed (CATB), a highly-modified Boeing 737 incorporating an F-35 cockpit layout. 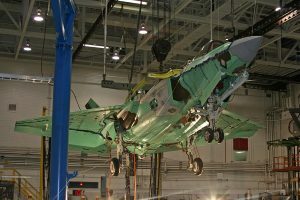 The third STOVL aircraft, BF-03, flew on February 4, 2010 as the testing for the US Marine Corps version pushes forward. 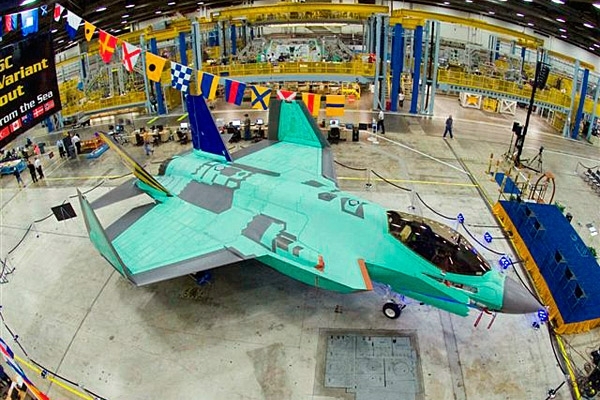 The first F-35C, CF-01, is rolled out for the US Navy in August 2009. Lockheed Martin is banking on its continuously moving mating line to move at 50 inches (1.27m) per hour at rate production. When AIR International visited the line it was static, but would soon move at 4 inches (100mm) per hour, according to one company employee. Lockheed Martin to perform full-scale drop testing. Test objectives include structural verification of the landing gear and airframe in accordance with US Navy requirements for carrier landing operations. CG-01 is fitted with special drop test fixtures, test systems and instrumentation to measure loads, stresses, deflections and accelerations at various locations on the landing gear and airframe. An F-35 cockpit has been fully flight tested in this Boeing 737 test aircraft owned by Lockheed Martin. 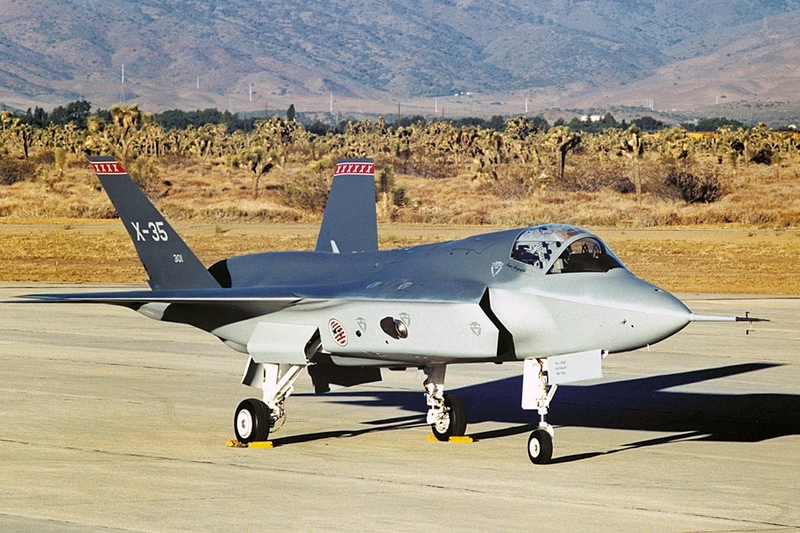 The X-35 prototype that won the fly-off competition against Boeing’s X-32. 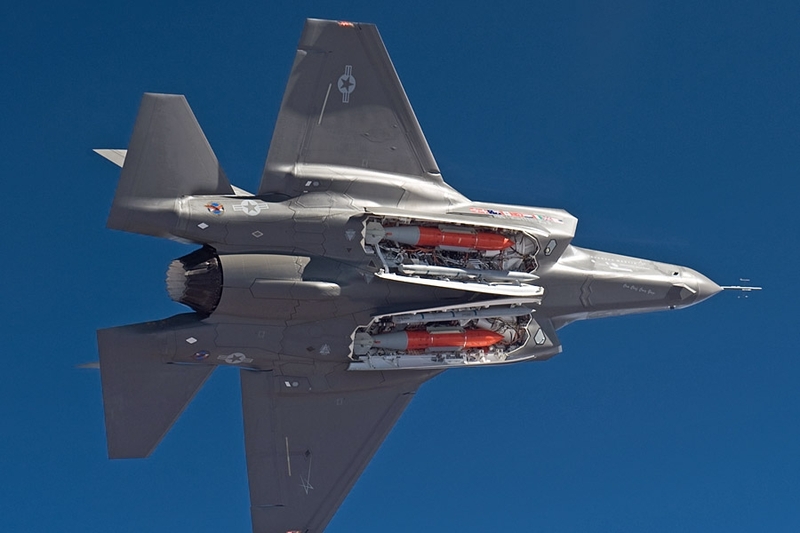 To preserve its stealth capabilities, the F-35 has been designed with internal weapons bays. In January a report issued by the US Defense, Operational Test and Evaluation Directorate (DOT&E) poured more fuel on the fire of concern over slipping deadlines and development timescales. The DOT&E reports directly to the US Defense Secretary, Robert Gates and is responsible for reviewing and analysing the results of OT&E for each major Department of Defense (DoD) acquisition programme. Dr Michael Gilmore, the Director DOT&E said that “the verification and flight test [programme] did not reach the tempo planned for FY09 due primarily to late deliveries of the remaining ten (of 13) System Design Demonstration (SDD) flight test aircraft.” He added that only 16 of a planned 168 flight test sorties had been accomplished. 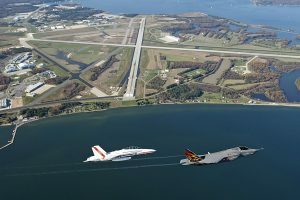 BF-01 is shadowed by an F/A-18 chase aircraft on a sortie from NAS Patuxent River in Maryland where the majority of the F-35 programme is being conducted. 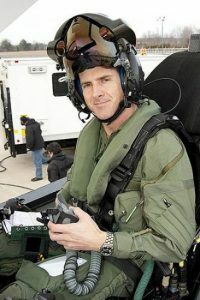 Squadron Leader Steve Long, a Royal Air Force serviceman became the first active-duty pilot from the UK to take the controls of the F-35B Lightning II Joint Strike Fighter in January 2010. Sqn Ldr Long flew BF-02 on a sortie from Naval Air Station Patuxent River on its 18th test flight, taking the aircraft to 20,000ft on the 80 minute flight. “Flying the F-35 was exactly like the simulators that I’ve been flying for over 18 months,” he said. He is currently on an exchange programme with the US Marine Corps flying the F/A-18C. 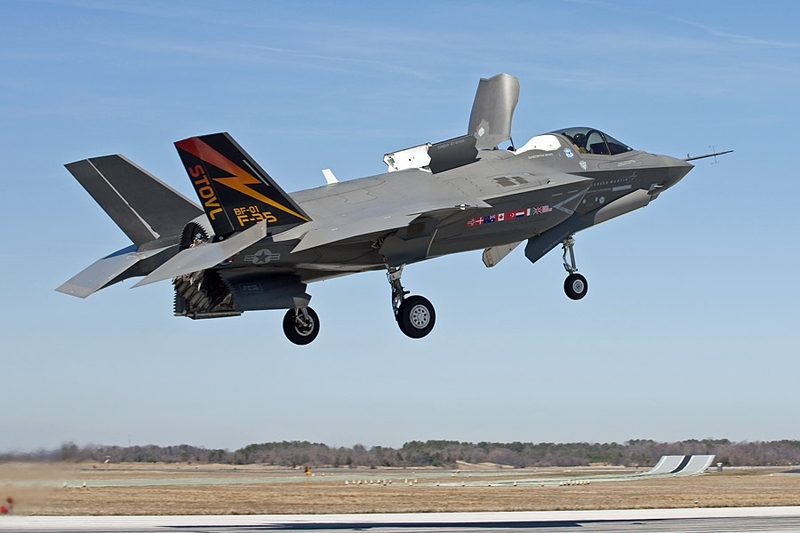 British pilots and ground crew will soon start initial training at Eglin Air Force Base in Texas in readiness to receive the first production aircraft. VFMAT 501 ‘Warlords’ is embedded in an Air Force wing, being part of the 33rd Fighter Wing based at Eglin Air Force Base in Florida, a first for a USMC squadron. The unit was redesignated from VMFAT 451, a 13-year retired squadron that was reactivated on April 1. 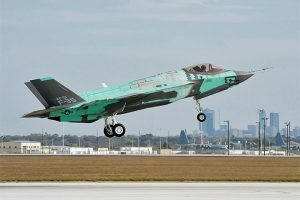 The squadron is hoping to receive its first F-35B before the end of the year, depending upon Lockheed Martin’s development programme, and the USMC still hopes to have eight initial cadre and two operational test pilots trained by the end of 2011. 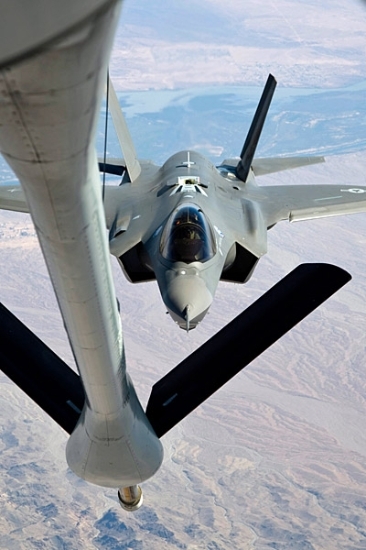 F-35 slides up to a KC-135R during a test sortie. The Nunn–McCurdy Amendment or Nunn–McCurdy Provision was introduced into US legislation in 1982 by Senator Sam Nunn and Congressman Dave McCurdy and is designed to curtail cost growth in weapons procurement programmes. The amendment requires programmes with cost escalations of more than 25% to be cancelled unless the Secretary of Defense can prove it is essential to national security and that no viable option is available. There is little likelihood of F-35 being cancelled, as Secretary of Defense Robert Gates will undoubtedly argue there is no alternative to the multi-billion dollar fighter. 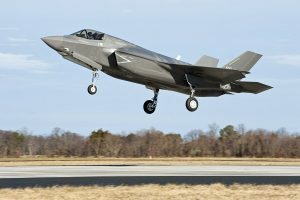 What is likely is that procurement plans will be reviewed with fewer fighters bought for the US forces and a possible rationalisation of the versions planned, with the F-35B and F-35C both experiencing technical difficulties. This is the second time that the F-35 faces a Nunn-McCurdy breach – the first was in 2005 when the project was re-baselined after several redesigns forced through the ‘weight-loss’ programme. 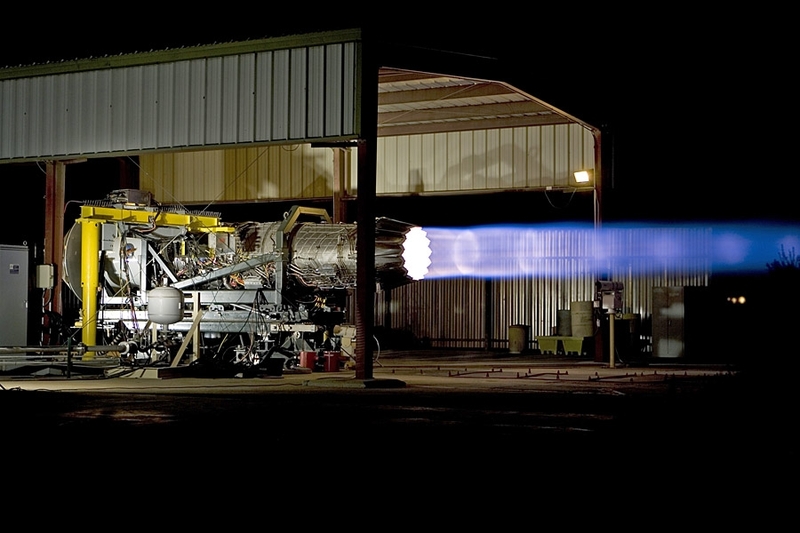 One of two engines currently being developed for the F-35, Pratt & Whitney’s F135 undergoes a full-power static test. 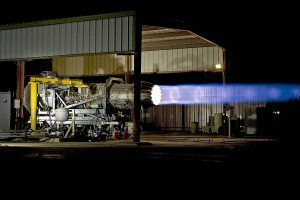 A constant debate in Congress is whether two different engines should be funded for the F-35 – the Pratt & Whitney-led F135 and the General Electric-led F136. In US President Obama’s budget statement in March, the battle lines were once again drawn. The AEP has been a political battleground for the last few years, and the Obama Administration says “the reasons for cancelling the AEP in 2007 remain valid today.” It believes a second engine “is unnecessary – financial benefits, such as savings from competition, have been assessed to be small, if they exist at all”. 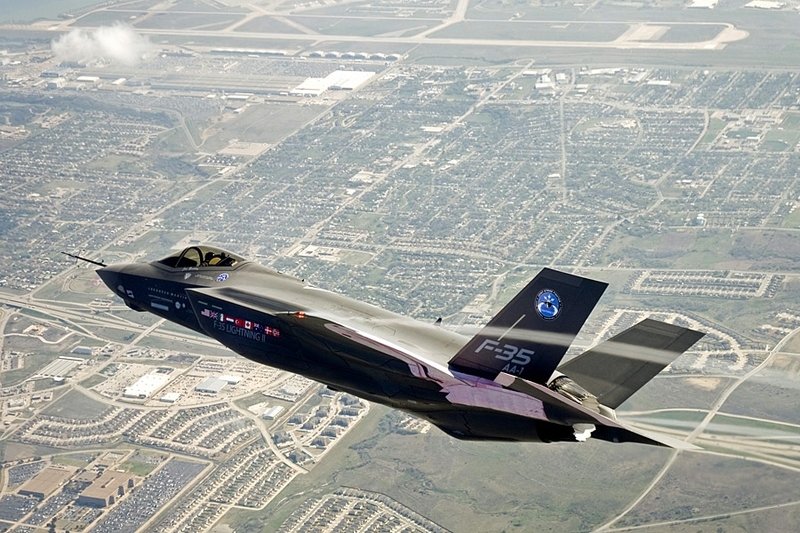 The second F-35A, AF-02, was the latest aircraft to join the test fleet on April 21, 2010.